One of the smartest ways to increase sales is by selling to people who are already purchasing from you. With Zipify OneClickUpsell, you can get more post-purchase upsells as customers complete their order. Zipify OneClickUpsell provides you with a powerful tool which puts relevant products in front of more, willing-to-buy, customers. As a bonus, you can also create post-purchase emails to get more sales, product reviews, and engagement with your customers. If you’ve been looking for a sales strategy to improve your Shopify store, perhaps Zipify OneClickUpsell is the way to do it. Upselling is a sales strategy that allows you to introduce more products to a customer, such as upgrades, add-ons, accessories, and more. If there are products in your store that pair well together, having the ability to upsell or cross-sell can quickly improve your store’s performance. One of the highlighting features of Zipify OneClickUpsell is that you won’t have to worry about losing a customer if they don’t want your upsell. 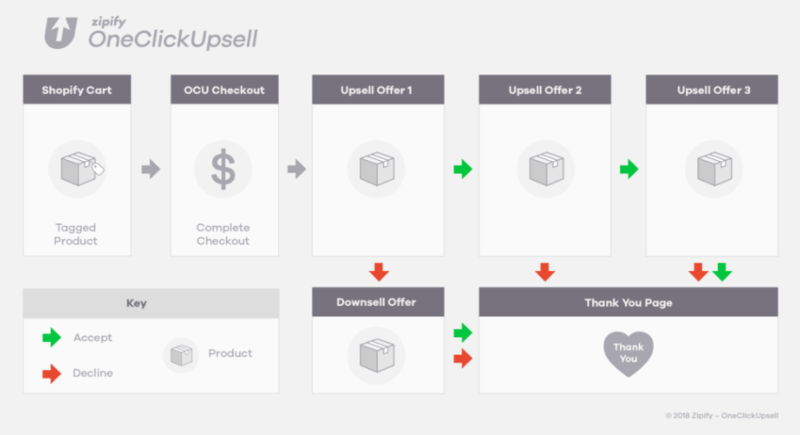 Your upsell offers are only visible after a customer has made their purchase for an item on your store. Zipify has developed a sophisticated Shopify app that makes upsells and downsells visible in a sequential order. This means, after your customer checks out and completes their payment, they will then be shown your upsell. If they reject the upsell, a downsell will then be offered. If you’re selling smartphones on your Shopify store, you can create an upsell for a high quality power bank. If your customer rejects this, you can display a phone case at a lower price point they might be interested in. You have full control over how many and what kind of upsells and downsells you want to offer to your customers. By developing a smart strategy, you can quickly improve your store profits. But first, you’re going to need a Shopify store to achieve that. To use Zipify OneClickUpsell, you must have a Shopify store. For anyone reading this review without one, you can create an ecommerce store, right now, for free. When you go to Shopify.com, all you need is an email to start a 14-day free trial. Best of all, you don’t need a credit card for this. 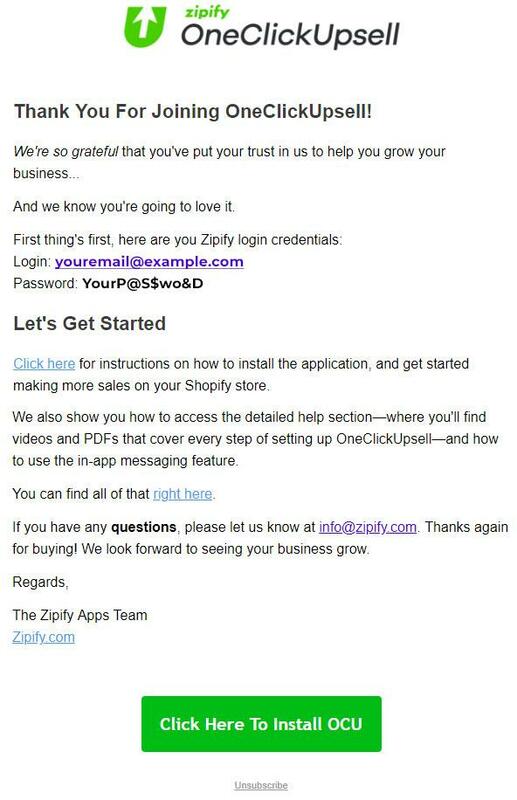 After you have entered your email and clicked “Get started” you’ll be asked for your store name and a password. The next step is to check your email for a confirmation message to activate your account. Getting started on Shopify is quick and easy. Then, with your account activated you are ready to start building your ecommerce store and installing Zipify OneClickUpsell. 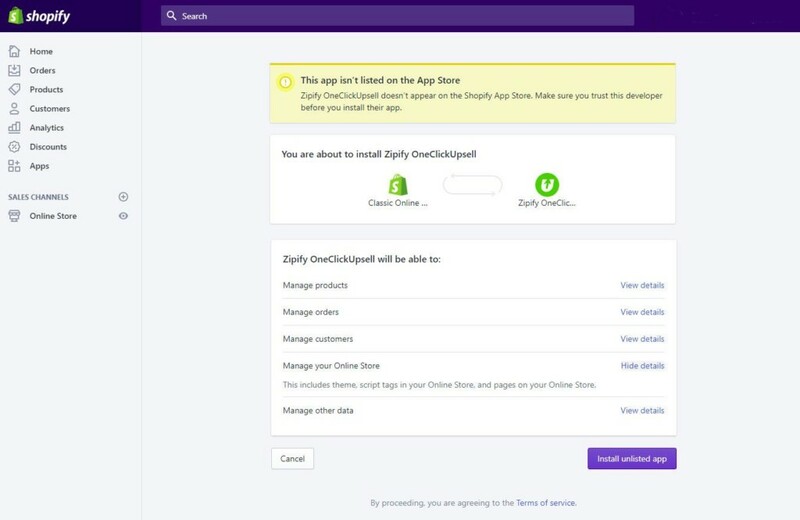 After setting up your free Shopify trial account or logging into your store, let’s look at how to install Zipify OneClickUpsell. Unlike other apps found in the for Shopify App Store, you will not find Zipify OneClickUpsell. Instead, you must go to Zipify’s website, and click ORDER NOW or scroll down to the pricing options. You have the option to pay for a monthly ($47 per month) or yearly ($397 per year) subscription. Once you have decided which plan is best for your business, you’ll be sent to an order form. 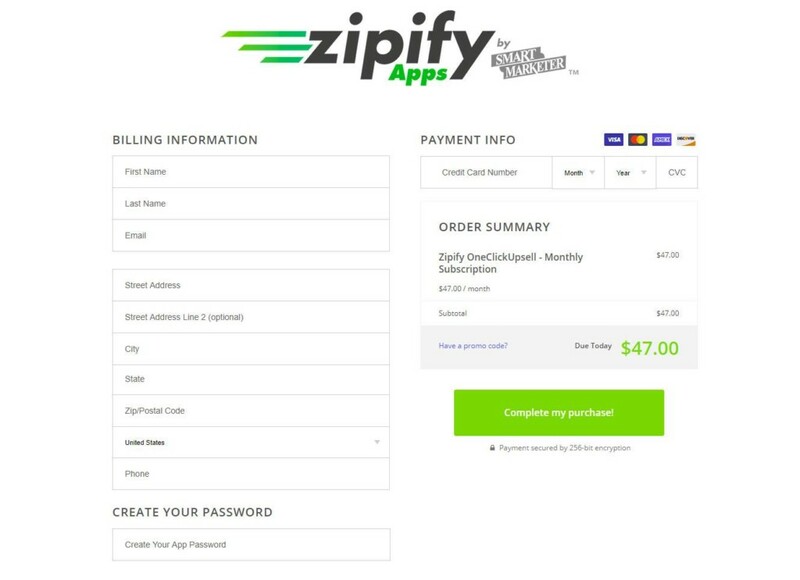 After making your payment, a confirmation email is sent providing you with more information about installing Zipify OneClickUpsell on your Shopify store. 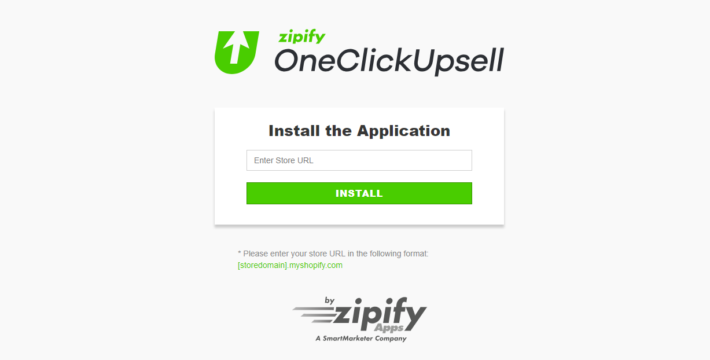 To install Zipify OneClickUpsell on your Shopify store, go to your confirmation email and click on the prominent “Click Here To Install OCU” button. Next, you’ll navigate to a page requesting your Shopify store name. Be sure to submit the full URL to your Shopify store (i.e. your-shopify-store-name.myshopify.com). If you’re already logged into your Shopify store, Zipify OneClickUpsell will appear in your dashboard. Before continuing with the setup of Zipify OneClickUpsell, you’ll want to take a moment to figure out your upsells, downsells, and overall strategy. To make the most out of Zipify OneClickUpsell, you’ll want to figure out which products to present to your customers. What are your best-selling small items? Which items in your store do people typically buy together? Are there any items that would pair well after their initial purchase? What do you want the customer journey to be like? How could you maximize your profits? What downsells would pair will with a rejected downsell? Your upsell strategy should be adaptable and meet the needs of your customers. Adjusting your upsells month by month would be the best way to see what works best. Once you have a strategy in mind and your products sorted into appropriate upsells and downsells, it’s time to set them up. Go back to the Upsell Tags and start adding labels. After adding a few, you can begin to link specific products to that tag category. If you’ve started a new store, you’ll have to add a few products first. Once you have uploaded your products and created all your tags, you can start to add upsells, downsells, and trigger products. You’ll be directed to a new page with the product you selected. Here you can set up whether it is an upsell or a downsell as well as other details that will appear on your store. Product Title allows you to create a new and unique title. Active / Inactive allows you to turn on and off upsells depending on the season or your sales strategy. Type of Offer allows you to decide whether this product is an upsell or downsell. Purchase Button allows you to create a custom and unique purchase button for your upsell/downsell. Decline Button allows you to create a custom and unique decline button for your upsell/downsell. 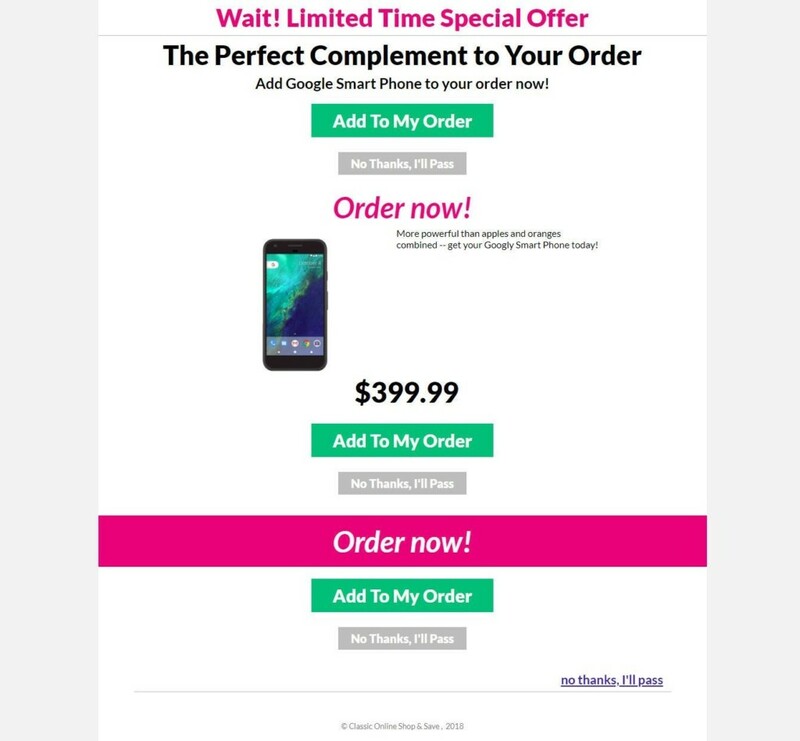 Offer Decline Link allows you to send customers who decline to your “Thank you” page. Image Source allows you to add additional images to your page. Discount allows you to provide a special discount (not found in your shop) for your upsell/downsell. Video allows you to add a product review or any other type of video on your page. Product Shipping Cost allows you to change the shipping costs, if needed. Enable Ability To Upsell Product Already in Shopping Cart is pretty self-explanatory. Priority allows you to choose one product over another if it has the same price and is found within the same Upsell tag. Variants To Use For OCU Offers, if applicable. When you’re satisfied with your settings, you can “Preview” the page or choose “Update” to put it into action right away. Zipify OneClickUpsell does not provide payment through your regular processing system in Shopify. To receive your payments, go to Payment Processor in the Zipify app. Here you’ll be able to configure how to receive payments. You can choose between Stripe and Paypal Express. Whenever a customer purchases a product, it will create a transaction in your Stripe or Paypal account. All purchases will create separate transactions. This means when multiple upsells are purchased, you’ll see respective transactions individually. The transaction IDs in your Stripe or Paypal account will be documented in your Shopify orders for reference. To activate the upsell and downsells funnels on your Shopify store, navigate to Preferences. To turn this on, click Edit >> Application Status >> ON. After you have turned on the Zipify application, scroll to the bottom and click Save. If you have linked your Payment Processor, the app should be ready to go. 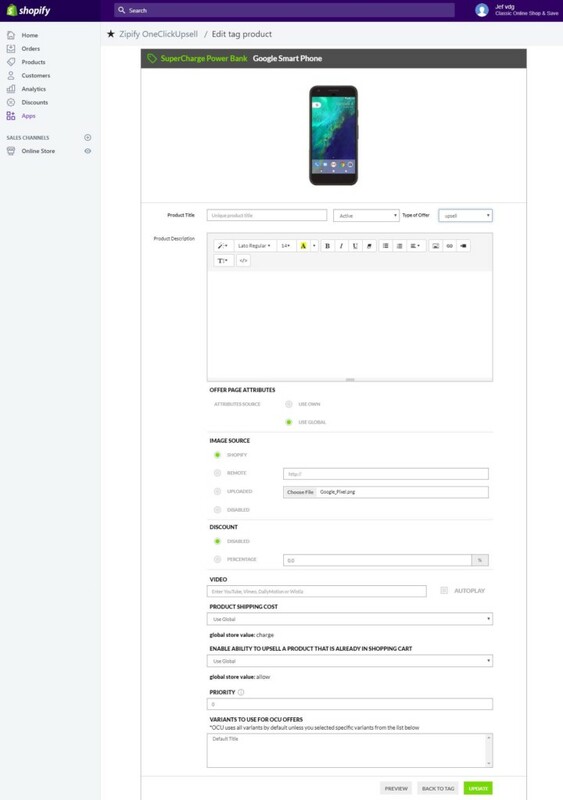 In the Abandoned Cart section, you can turn it on and connect relevant CRMs. 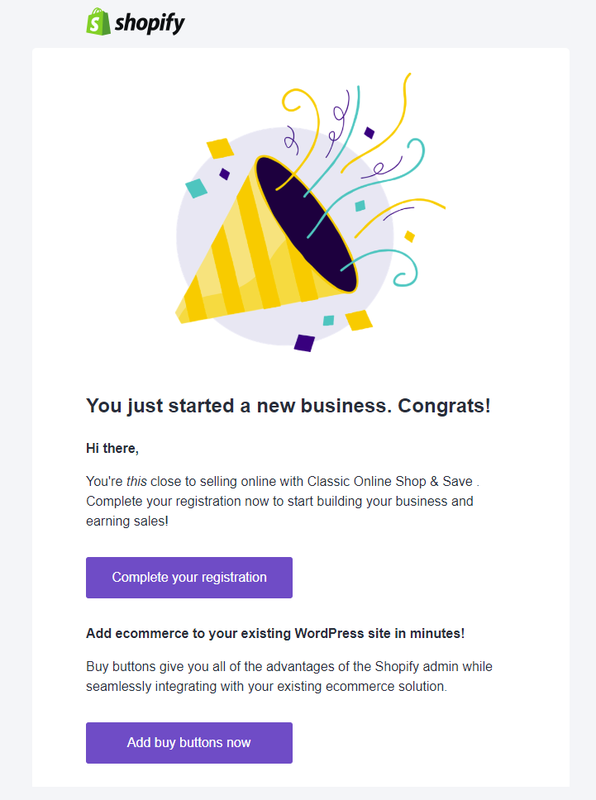 This review covers the basics for getting started on Zipify and setting up some upsells. Although you have to make a payment to give OneClickUpsell a try, when you discover a few winning upsell funnels, you won’t be wanting your money back. Overall, Zipify OneClickUpsell represents a powerful tool for Shopify store owners to increase their profits post-purchase. If you haven’t been tapping into the full potential of what your customers may be willing to buy, provided they’re being asked at the right time and with relevant offers, it’s time to start upselling!